Her Legacy…June E. Cox, age 93, passed away, February 8, 2019. June was born in Detroit, MI on June 2, 1925 to Howard and Pauline (Dippert) Kennedy. June graduated from Detroit Central H.S. in 1943. She worked at the Michigan Central Railroad Depot for 10 years, and was able to travel all over the US and Canada on free passes, including a trip to Lake Placid, NY where she rode the Olympic Luge Run and riding a mule down into the Grand Canyon. She also enjoyed going dancing at the Greystone and Grande Ballrooms in Detroit. She moved to Royal Oak in 1953, and lived there for 50 years, retiring from Troy School District in 1987. 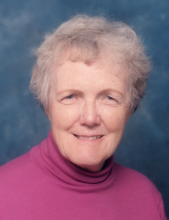 June was an avid hiker and enjoyed many hiking trips with her friends. June was active with American Youth Hostels and the Sierra Club and was a volunteer for Meals on Wheels. She will be remembered for her kindness, enthusiasm and great sense of humor. Her Family…June is survived by her daughter, Sharon (Tom) Marvel; grandsons, Neal and Scott; stepdaughter, Anita (Paul) Campbell; 4 step grandchildren; and cousin, Sharon. To send flowers or a remembrance gift to the family of June E. Cox, please visit our Tribute Store. "Email Address" would like to share the life celebration of June E. Cox. Click on the "link" to go to share a favorite memory or leave a condolence message for the family.